Cooler Master recently announced a partnership with ASUS to produce a new line of TUF Gaming-branded products in collaboration with ASUS’ TUF Gaming initiatives. TUF Gaming is a product series from ASUS that is focused on durable and reliable gaming products. ASUS’ TUF Gaming Alliance, in turn, is a joint effort between Cooler Master, ASUS, and others in order to create a line of products for ‘an aesthetically cohesive gaming PC’. 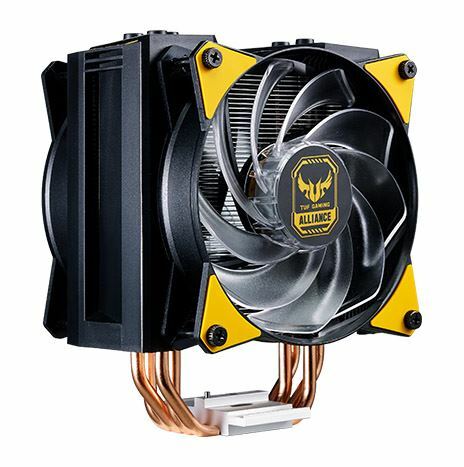 Cooler Master’s role in this collaboration is to provide select chassis, cooling, and power supply options with three main design concepts: functionality, reliability, and visual consistency. In essence, we are looking at multiple partners rebranding products under a common aesthetic umbrella in order for a PC builder to more easily find and build a themed PC with quality products. As far as which Cooler Master products will get the new digs, users will see the Masterbox MG500 mid-tower case, the MasterAir MA620P and MA410M heatsinks, and the MasterWatt power supply range in 450W, 550W, 650W, and 750W capacities. These specific components, Cooler Master says, were ‘specifically chosen because of their ability to run your games smoothly and reliably’. 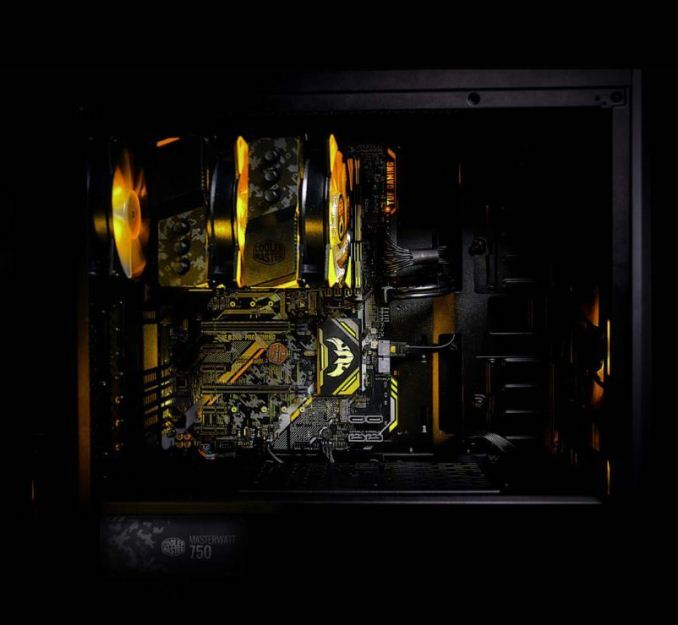 The Masterbox MB500 incorporates the TUF Gaming camouflage/military styling with greyscale camouflage on the top, front, and on the edge-to-edge tempered glass side panel. The other difference is on the inside where the PSU shroud is cut out in order to display the PSU underneath (no doubt a MasterWatt TUF is what they are thinking). Otherwise, the case itself is the same allowing up to an ATX sized motherboard, 160mm clearance for CPU heatsinks, 400mm for video cards, and a maximum PSU length of 180mm. The MB500 case is able to house up to 3 120mm fans (2x 140mm), or up to a 360mm radiator in the front panel, 120mm radiator or fan in the back, and two 120mm fans up top. 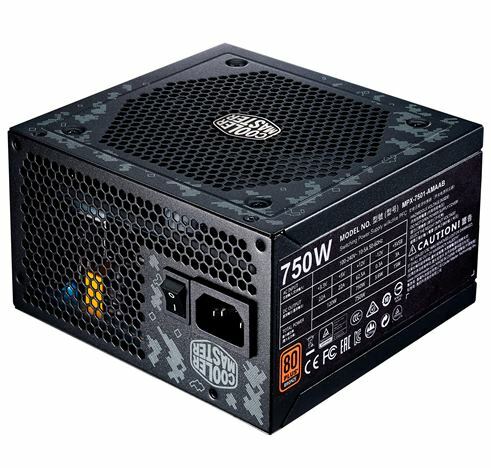 The MasterWatt series of power supplies available for this endeavor comes in four wattage choices - 450W, 550W, 650W, and 750W models all receiving the same TUF Gaming treatment with the digital camouflage. We can see the same design on all sides except for where the specifications table is printed. The MasterWatt lineup is 80 Plus Bronze rated and offers users semi-fanless operation, modular cabling (outside of ATX/EPS cables) that is said to be thicker than standard market cables at 16AWG, and a 5-year warranty. In order to keep the CPU cool, Cooler Master has selected two air cooling options in the MasterAir MA620P dual tower heatsink and the MasterAir MA410M single tower heatsink. 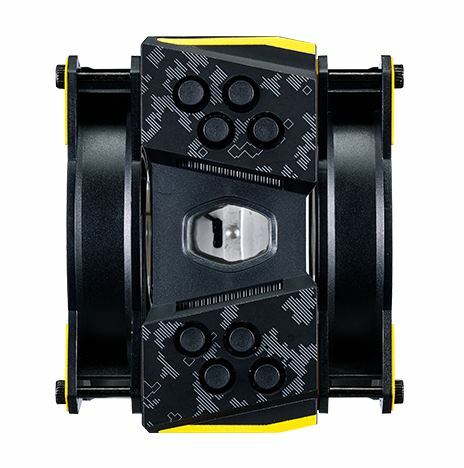 Like the other products in the TUF Alliance, these get the TUF Gaming treatment as well with the camouflage on the top of the tower(s) a TUF Gaming Alliance sticker on the fan hub as well as the TUF ‘yellow’ color on the fan mounts. 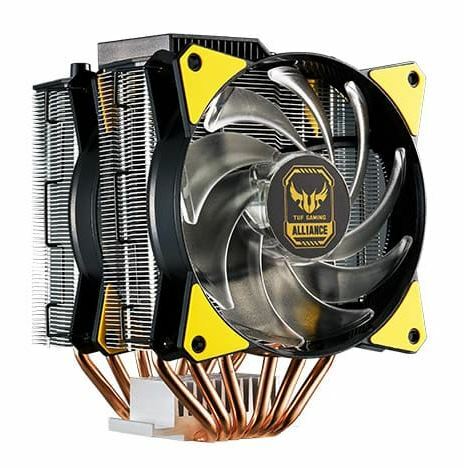 Both coolers include MasterFan MF120R RGB fans (one with the single tower MA410M) able to be controlled through motherboard software or using the included wired RGB LED controller. 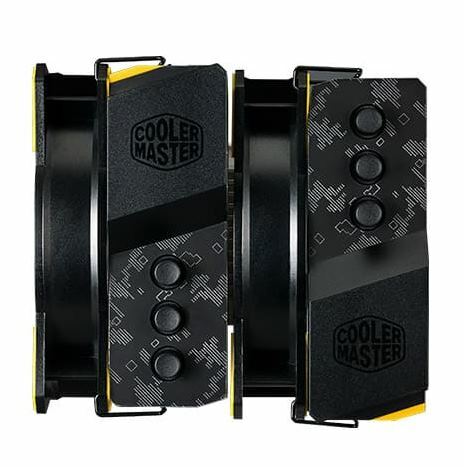 Both coolers use Cooler Master’s Continuous Direct Contact Technology (CDC 2.0) that is said to increase the contact surface area of heat pipes by 45% thus enhancing heat transfer. Each cooler is said to be tool-free mounting and the universal retention brackets support Intel LGA 115x, 1366, and 775 sockets, while on AMD it is compatible with AM4, AM3+, AM3, AM2, FM2+, FM2, and FM1. 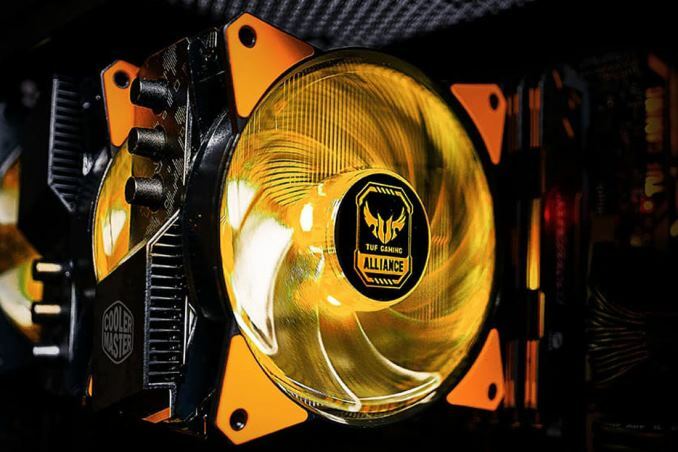 Overall, the TUF Gaming Alliance appears to be a neat way to simplify a themed build and ensuring users are using quality parts that should match exactly. The alliance takes the work out of picking functional, reliable, and visually consistent parts as it intended, but at what cost? Pricing has not been listed however we do expect a slight price premium for the added convenience the program provides. Along with Cooler Master, it appears ASUS has teamed up with TeampGroup, as well as G.Skill and Micron for a complete TUF ecosystem. 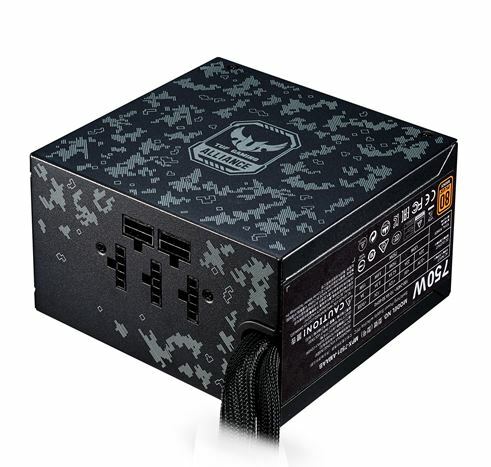 The MasterAir MA410M and MA620P are available now for pre-sale in North America while the MasterBox MB500 and MastwerWatt TUF Gaming Edition Power supplies are expected to be available in North America at the end of June 2018. Availability of the Cooler Master TUF Gaming components may vary per region and component. Why are so few making high end cases as Monitor stands to save desk space??? IMO Asus really has "slipped" in the past decade or so compared to other company offerings, they used to be quite top notch, they seem to be more of "just another option" these days, granted I have always found their BIOS layout to be quite good compared to many, easy to find things, easy to use.